Everybody has been talking about Ms. Meena. Every time the play comes to Bangalore, somebody is always telling someone else why they should not miss Ms. Meena (pun unintended). Why, even Citizen Matters has already reviewed the play! At long last, I stood in line, and a long line it was, to watch our darling Ms. Meena. CDs of the play were being sold, and anywhere you looked, all that you could see was a Tamil Maami straight out of a 70s edition of Ananda Vikatan (a magazine). The poster also said that the play was in English and Tamil, with a smattering of other languages; this was something that thrilled me to no end, as I belong right there on the Kerala-Tamil Nadu-Karnataka-England border. Ms. Meena is a film star (super star of super stars) who is coming back to her native Pichampuram after twenty long years. However, Pichampuram is now a village going to seed. The mill has closed down, the lands have been sold, and there is virtually no economy. All hopes lie on shopkeeper Ravi, who was Ms. Meena’s ex-flame. Perhaps he can manipulate her through her dormant feelings for him, and do the village a good turn by getting her to donate money. Ms. Meena is there to do just that; she is going to shoot "Oru Pennin Kathai", a movie based on her life. Of course, this will change the fortunes of the village, but Meena has a price. She wants justice-Ravi had betrayed her when she was with child twenty years ago. In the 22 days it will take to shoot the movie, the villagers must deliver Ravi to her, dead. The tide of popularity turns against Ravi, and slowly he is left all alone. The villagers are also embroiled in Meena’s machinations, they have no choice but carry out her will, and the story can end only with the death of Ravi, who finally decorates the village in the form of a statue. The play itself begins with a very catchy song and dance routine, and it takes the actors about 30 seconds to win the audience over. At the end of the song, the audience is in the palm of their collective hand. Comic situations and characters abound, and witty dialogues and songs in the "smattering of tongues" keep the audience regaled. Adding to the magic is the way the stage and props are used. The play follows a rough theatre format, and all the props and costumes surround the acting space. The director cleverly uses the action to allow seemingly magical entries and exits. Daily props like buckets become cameras, cycle pumps become microphones, bubble wrap sheets become waterfalls, winnows, brooms, and buckets form a bus, and-stop me if you’ve heard this one-the benches and stools and duppatas and brooms and winnows magically turn into our lord Ganesha. By this time the audience has been ambushed by the actors; they can do no wrong. Now and then, a few heavy scenes come by, but the director cleverly reads the weight of these scenes and transits into lighter stuff again. The actors are all at ease, but Anitha Santhanam is really the superstar of the play. She flits in and out of various roles and accents with the comfort that only those who spend their lives performing can have. The adaptation to India (the original play is called The Visit) is done really well by writer Rashmi Ruth Devadasan. The use of cinema as the background really brings out the slapstick well and also provides a "musical" feel. 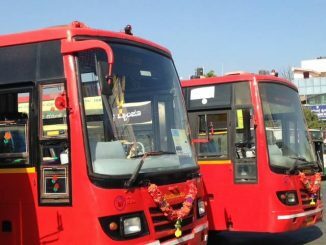 The easy flow of English and Tamil with other languages resonates perfectly well with us who "chill" with the dudes, head bang, and then head home for namma dearest thair saadam and kaapi. Director Rajiv Krishnan also plays extremely well with the script and creates a flawless piece that keeps the audience enthralled for two and half hours. As the play approaches the end, it turns rather macabre. Ms. Meena, beginning to enjoy her pound of flesh, does a shower scene where she croons about bathing in the blood of her former love. At this point, a faint sense of disconnect seems to appear. How can such a jolly play move in this direction? In the original play, Claire (the original Ms Meena) already makes clear her intentions in the beginning. This is symbolically reflected by her pet black panther, a coffin, and her two former husbands who are now blind eunuchs. The seeds for the macabre nature of the play appear to be constantly sown in the original play. Here, this is not strongly reinforced (it is reinforced, just not so you’d notice the first time), and thus the ending can leave a faint sense of fuzziness. What is very dramatically reinforced is of course the very melodramatic nature of Indian cinema, and how it is so integral to us. However, the play is definitely a great evening’s outing. The actors with their sparkling chemistry, the sets, props, music and the clever direction all make Ms. Meena a definite hit. What’s special in this edition of Bangalore’s book fair? 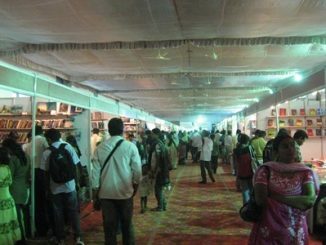 There are 300 book stalls with over a million titles at the 8th annual book fair at Palace Grounds. Don’t miss the part on the special offers and discounts at the fair.